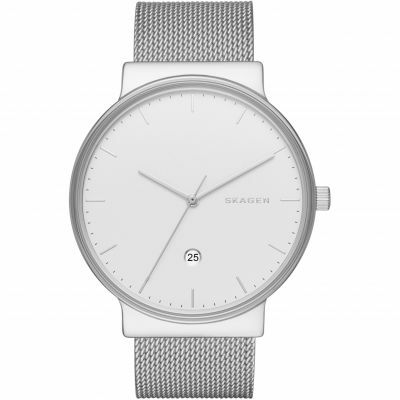 Skagen Ancher SKW6082 is an amazing and very impressive Gents watch. Case material is Stainless Steel while the dial colour is White. The features of the watch include (among others) a date function. In regards to the water resistance, the watch has got a resistancy up to 30 metres. It means it can be worn in scenarios where it is likely to be splashed but not immersed in water. It can be worn while washing your hands and will be fine in rain. We ship it with an original box and a guarantee from the manufacturer. 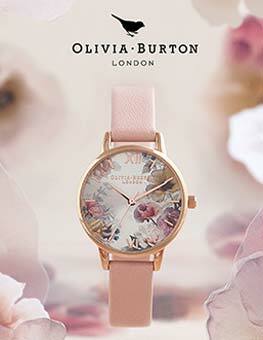 Beautiful watch, lovely colour leather strap. I bought the watch for my fathers 80th birthday, he likes a white face with black numbers, the face is so clear and is a really good size, it will be perfect for him. The watch has a very slim profile so I imagine will be very comfortable to wear. I would highly recommend this watch to anyone, with its classic looks and traditional leather strap, its perfect! Great watch, at a price that beat all competition. Next day delivery for free is great. very please with the watch. Its fantastic, clean and simple royal looking. Bought for my husbands 70th birthday I love it so hopefully he will too. This watch has a large face making it contemporary looking. It is very slim with a smart leather strap. Most importantly, it has met the approval of our 18 year old son which is no mean feat! 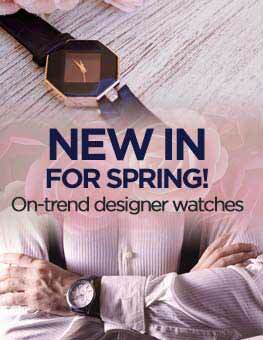 An excellent choice of watch which can be worn casually as well as on a more formal occasion. 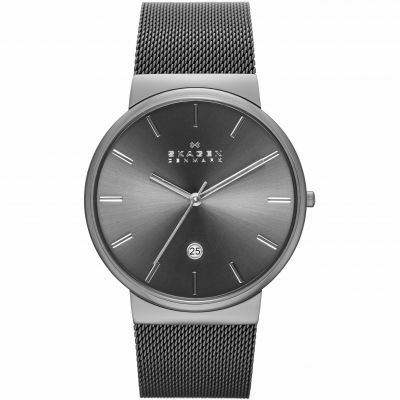 I bought this for my husband as he loves the sleek lines of Skagen. He absolutely loved it. The watch face was a bit bigger than I had anticipated from memory, a little over 3cm, but I cant say exactly because hes out wearing it. It looks classic and expensive when its on his wrist. I am very happy with it. Great looking watch, easy to read clear face. The right size, I think some watches are a bit too big. Good price, have seen it elsewhere locally at a much higher price. Good looking, elegant. Very large face if you have a small wrist though. Nice leather strap. Fantastic watch and service from watch shop. Ordered and I received a text to inform me my product was in store to collect the following day. The watch was a gift for my partner. The watch is lovely. the face is slightly larger than i had imagined but beautifully simple and clear. I love the blue second hand especially. The leather starp is also very comfortable and soft. I must admit to going around asking people to ask me the time so i can look at it and show it off! Nice watch sent as a present which my father really likes and suits him. It is simplistic yet stylish - bought this watch as a present and am extremely impressed by the look and quality feel of the product. Despite being a mans watch I bought this for my wife and she loves it. It combines style with functionality. The strap is good quality leather with a soft feel, the watch itself is slim on the wrist and the face makes it easy to read. It looks and feels a quality product. This is a fantastic watch. Really stylish and brilliant. Fantastic service an really quick delivery time. 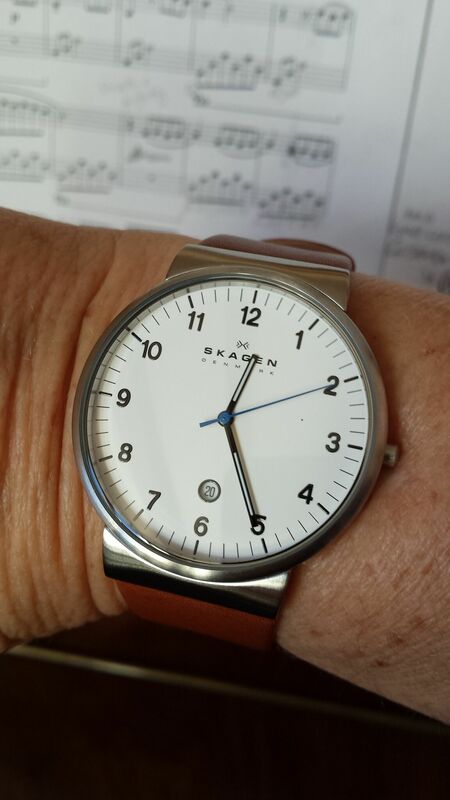 Really happy with my new Mens Skagen Ancher watch, with its old-school looks, coupled with scandic design thinking. Slim and elegant. Will be my go-to watch for formal occasions. definitely cannot fault the top class service as always. This is my first Skagen watch and I am very impressed with it. A large clear dial, slim casing and comfortable leather strap. It is easy to wear and weighs only 41g in total. If you want a slim, stylish and elegant watch without all the extras that big clunky watches have, then this is well worth your consideration. It looks great. 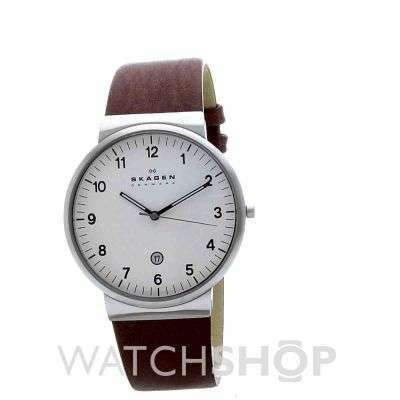 It is to replace a previous Skagen watch and is a gift. I like the big clear face and the date facility. Heres hoping the recipient likes it as much as I do! Great product. Arrived very quickly and gift wrapped in perfect condition. I love the slim profile on this watch. Perfect for those who dont like big heavy, chunky things on their wrist. 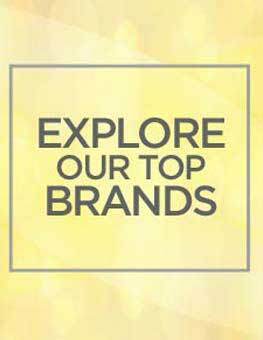 Classic design and comfortable fit. Lovely. Quite small for a big bloke though. 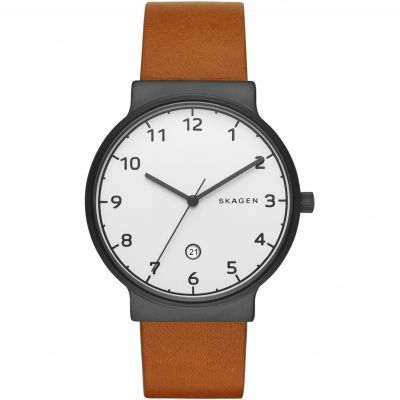 Id been looking for a while for a stylish, minimalist watch and this is perfect. Simple but elegant, extremely comfortable to wear, the face just the right size - big and bold but not overdone. 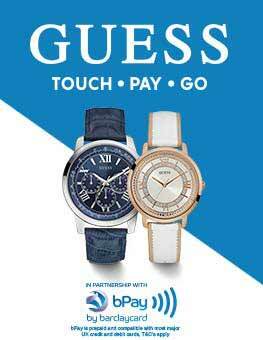 Great stylish watch, with a simple design, looks great on. My husband was very pleased with it. A very elegant and contemporary skandi style watch. My husband loves it, its a nice size and shape and a really simple style. Ordered this for my partner for Christmas. He had seen it in a department store and loved the classical elegance of it. His watch broke a few months ago so I caqnt wait to see his face on christmas day. He will love it and the service was excellent. Will be using you again especially as I want a watch myself after the Christmas holiday. Fantastic watch I have purchased for my brothers Christmas present. Very quick delivery will use the company again. Pleased with my purchase ,arrived very quickly and packaged well. I bought this for my partner as a birthday gift and he really loved it. It is the perfect size for a work watch with a clear face. He has smallish wrists and it fit perfectly. Its really smart for the work place, and trendy for outside of work. 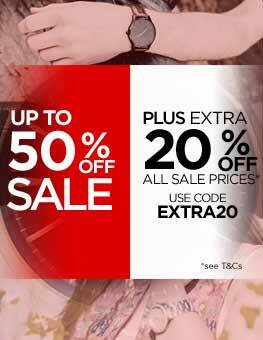 Watch looks amazing, slim fitting watch for everyday use, simple but elegant that should be for a male but equally good for females. This was a gift bought for my sisters 40th birthday but unfortunately there was nowhere we could write an inscription, my only complaint! Liked it in first look. Simple, elegant and great finishing. Nice leather colour. Great watch, elegant simple classic lines but with useful date function. Very slim body. You should also note the unusual way the strap is clamped in the body without the usual pins and gaps between body and strap. Very Nice Watch, Very Clear Face, The Style of the watch is Excellent plus the Leather Strap really sets it off. I am so impressed with this watch. The simplicity married with excellent build quality makes this my preferred time piece and I have many! A gentle convex glass set in a low profile frame gives maximum visibility without requiring the watch to be obtrusive or bulky. The strap is soft and comfortable, and is a slightly darker brown than the pictures here represent which is fine with me. The blue second hand is also darker than the pictures here, but is a lovely touch. This is a watch that will stay with me for a long while, and its simplicity makes it timeless and stylish. Very nice watch for the price. Slim design making it suitable for gents with a slim wrist. Really like this watch, big watch face easy to see and use. Dtae and time setting again easy to use. Great price and the watch arrived in quick time! This is a fantastic looking watch, clear face, slim on the wrist so not bulky. A quality item.